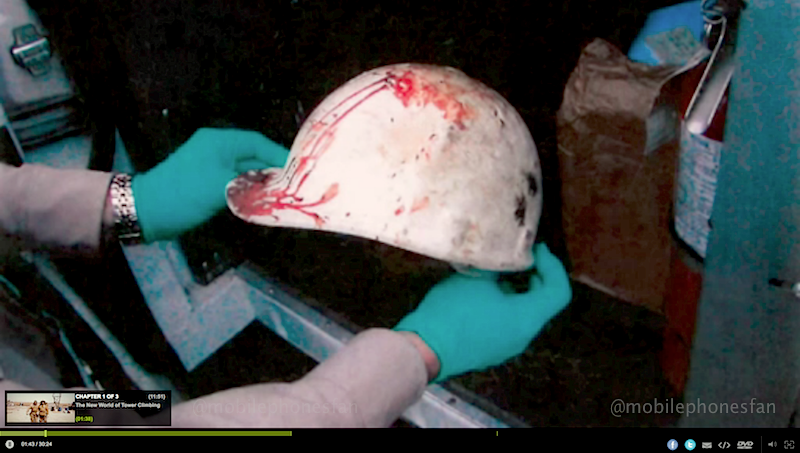 Two days after PBS aired a Frontline report on high rates of fatal injuries among cell tower workers, one of AT&T's major construction management partners has halted tower work in several states to complete a review of safety practices. Goodman Networks of Plano, Texas, notified workers of the mandatory stand-down on 24 May, eight days after technician Shad Lierley fell 100 feet from a tower near Austin, Texas. Reports say he was a subcontractor, hired by Goodman for an AT&T project on the site. Goodman confirmed the stoppage; AT&T refused comment. Interestingly, AT&T had been a focus of that Frontline program, 'Cell Tower Deaths'. From OSHA data, reporters for ProPublica and Frontline determined that 50 out of the 100 tower-climber deaths from 2003-2011 occurred on cell sites, the rest on radio or TV towers. Surprisingly, this means work-related fatalities were ten times higher for cell tower climbers than for all US-based construction workers, as a whole. More shocking, AT&T's share of those deaths (15) turned out to be nearly double that of the other leading US carriers, combined. Frontline also correlates statistical spikes circa 2006-2008 with timing of an expedited build-out of AT&T's 3G network, begun just prior to the release of Apple's iPhone ...at that time, sold exclusively by AT&T. 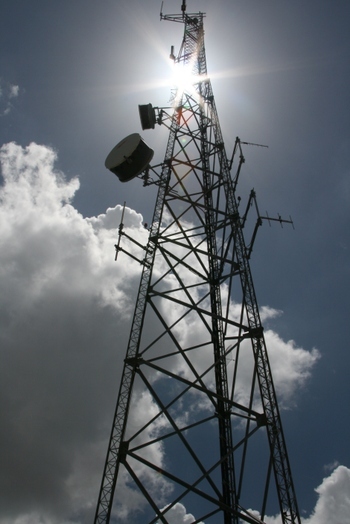 Of the 19 total climber fatalities for 2006, 10 occurred on cell sites including 6 deaths over a 5-week period. And 8 of the 12 climbers who died in 2008 were doing cell tower work, including a spate of 7 deaths in just 5 weeks. In both years, as with the entire 2003 - 2011 span, more of these cell-site fatalities were on AT&T projects than those of any other carrier; spike periods included. ProPublica's report also points out that the spike in 2008 occurred at the tail-end of AT&T's 'upstream upgrade' program, which involved multiple towers being converted from older HSDPA technology to HSUPA. And when, at the start of that 2008 uptick, two climbers doing AT&T work died less than 48 hours apart, the company ordered their turf vendors to stand down...much as they appear to have done in Texas, last week. Were these tacit displays of guilt or simply smart moves by head office execs who realized it was time to slow things down? "Fifteen, twenty years ago, a good tower company might build four towers a year. Now timelines are radically different. So instead of a contract to build a tower, you have contracts to build 40 towers." Tho' it's easy to blame work accidents on AT&T's aggressive push to expand their 3G network, it's quite another thing to show cause. Did AT&T really put workers' lives at risk? if so, how... by what action or inaction? And did AT&T executives fully understand the consequences? That's where Frontline and ProPublica hit a firewall: none of the men were directly employed by AT&T. Analysts claim AT&T outsources 98% of their tower work via management firms like Goodman -- a class of middlemen known as 'turf vendors', who hire out specific jobs to local, independent subcontractors. 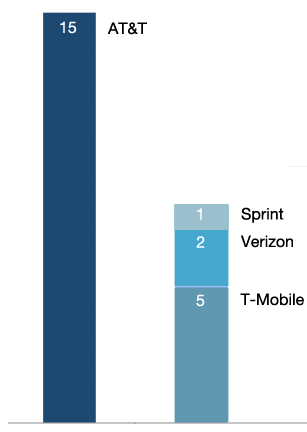 It's part of a trend for telecommunications (Sprint began a shift to 100% outsourcing in 2010) and for US business, in general. And while proponents crow about lower costs and more efficient use of manpower, detractors point to unfair wages and what amounts to willful ignorance of unsafe working conditions. Based on contract terms, mobile operators certainly do gain efficiencies; they drive a hard bargain, with intense price cutting and strict schedules. One example from 2008: AT&T paid $187 for installation of a radio head. Contractor and sub split 50/50; for $93, he drives to the site, goes up the tower, does the install, then heads down. So, for $187 AT&T gets a shiny, new radio head on a cell tower. But more important to their bottom line are all the things they don't get. : No employee orientation, no hassles with the CWA union, no company- owned equipment (truck, tools, safety gear), no benefits or overtime pay and no need to supervise the work. From the carriers' perspective, it's a very tidy arrangement. AT&T even builds in some future-proofing. ProPublica says the contracts they saw include annual 5% price-reductions ...that's 5% per year, over the course of a 3-year contract. If this is passed along to the subcontractor, then next year he'll be doing that radio head install for $88, which will be worth $86 after inflation. "By the time we get to the actual person with a tool in their hand, we have significantly reduced the financial benefits. And we have put three or four layers of communication problems into the intended final results." According to Frontline's analysis, this is where things go wrong. Many tower monkeys (what they call themselves) say they can't afford to work for those low rates. Overhead costs -- fuel, equipment, various kinds of insurance -- are higher than ever, leaving too little for a living wage and a decent work-schedule. Those climbers who try are forced to cut corners, inevitably leading to work accidents. ProPublica's investigation backs these claims. Some contractors are hiring unskilled workers, giving them quick on-the-job training before sending them up into cell towers for as little as $10 per hour. Supervision is often non-existent, with scant attention paid to proper use and care of safety gear, much less to safety training. "It's good sense for the carrier to do it. And it's good for the turf vendor, because they're making a lot of money off the project. But it's not good for the person down...when it gets to the field and the work's gotta be done. There's a lot of good companies that won't work on [cellphone towers] 'cuz the money's not there. So, instead of paying this amount to this guy, who's really qualified -- been in the business, has a great reputation -- they hire this person over here, because he's available right now and he'll do it for what they want him to do it for." But mobile operators say that's not their problem. When AT&T signs a turf vendor the agreement goes way beyond contractual basics -- what, where, how much, etc. -- and itemizes up to 100 separate tasks in a Division of Responsibilities Matrix: which tasks require pre-approval, which don't and who assumes responsibility. "AT&T outsources wireless tower construction and maintenance to expert companies, many of which are large publicly traded firms with decades of experience. Our contracts with these companies require strict compliance with state and federal laws and regulations, including worker safety. AT&T requires these contractors to establish a separate safety organization to fully train their employees. We also require all of our contractors to perform background checks, including drug screens, on every individual who works on our projects. Contractors who violate the conditions of their contracts are subject to termination. Worker safety has always been a hallmark of AT&T." Again, this is all perfectly legal. Nobody is forcing the turf vendors to sign on with AT&T and nobody is forcing the subcontractors to take the turf vendors' money. Still, lots of people see multi-level contracting as just another example of big business skimming the profits while passing the costs and risks to average workers. While turf contractors can take 40%-50% of the carrier's fee per job, the actual work they do is limited to dispatching supervisors to half (or fewer) of the work sites. Subcontractors pay all job-related costs. Remember how Goodman Networks announced work would stop for a safety review? The subcontractors pay for that, too. Tower climber death scene, 2006. 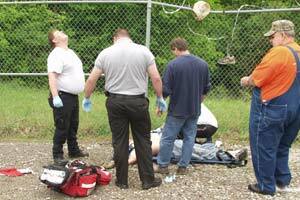 Until the recent Lierley incident, some thought the system was finally working. From late 2009 through 2011, tower technician deaths (9) were much lower. Even AT&T saw just a single fatality on their sites. Optimists spoke of a renewed focus on safety. Pessimists pointed to the sluggish economy, with fewer cell tower jobs. Climbers noted the cyclical nature of network upgrades; after the towers have been rigged, all that remains is ground-level work. And critics say nothing's really changed -- not for the better anyway. Those 50 lives were lost because saving time and money took precedence over due caution and common sense. So, they ask, what's going to happen when we see the next big push in mobile ...when all the carriers need to expand their 4G networks? "There's no time to season these employees. There's no time to mature them. There's no time to train them. So. we have increasingly less experienced, less trained, less capable individuals doing increasingly large projects, at increasing pressure. And with decreasing compensation." "We're going to have a bad year as an industry, because they're going to go on a big push and your $10 an hour pizza guys that are now climbing for you -- 'cuz you can't afford otherwise -- are going to start skipping steps." What you've read so far is only part of the story. We left out details that show OSHA to be either powerless or incompetent, personal stories of climbers and their families, and much more. Be sure to watch the video at Frontline -- it's typical of their fine work. The Frontline and ProPublica sites also have more background info, with links to articles and video segments that had to be cut. While you're there, give a thought to contributing to your local Public Broadcasting radio or TV station. They could use your help.